In one of the stranger games you’ll ever see (the two teams set an NFL record for return touchdowns in a single game with five total), the Ravens successfully defended their home turf against Rex Ryan and his band of blowhards, earning themselves a 34-17 victory and a share of the AFC lead at 3-1 heading into their much needed bye week. Well, Ravens quarterback Joe Flacco didn’t complete a single pass between 2:37 in the first quarter and 11:50 in the fourth quarter, missing on 11 straight between those two bookends, was 10/31 (33%) overall, the Ravens still managed to hang 34 points on the scoreboard, and Flacco was still the best quarterback on the field. As bad as Joe was, Mark Sanchez was even worse. The Jets’ QB went just 11/35 (31%), and while Flacco was betrayed by his receivers who dropped a couple good throws, most of Sanchez’s passes were nowhere near…well, anything, really. Both quarterbacks did, however, manage to throw touchdown passes. To the other team. Flacco’s on a miscommunication with Ray Rice that resulted in a 35-yard touchdown interception return by linebacker David Harris, and Sanchez’s a woefully weak-armed out route that allowed Lardarius Webb to step in front of Santonio Holmes for a 73 yard score of his own. On a day where 10 more NFL quarterbacks passed for over 300 yards (and two for over 400), these two teams showed that there is indeed still a place for defense in the NFL. The Jets and Ravens combined for 283 yards passing between them. The Ravens, playing with a depleted secondary (safeties Bernard Pollard and Tom Zbikowski alternated as the 3rd cornerback for most of the game), put all their eggs in the “get after Sanchez” basket, and to say they were successful would be an understatement (calling it the greatest defensive performance you’ve ever seen, as John Harbaugh did, would probably be an overstatement though). B’More battered and bruised Sanchez all night, from literally the first play, when Ed Reed came off the edge for a sack-fumble that resulted in a Jameel McClain touchdown. Though they only registered two sacks for the night, they hit Sanchez countless other times, to the point where he was ducking as he threw late in the game. Of course it didn’t hurt that both sacks resulted in fumbles returned for touchdowns. On the second, Haloti Ngata basically drove a truck though Sanchez as he was winding up to throw. It was close as to whether or not Sanchez’s arm was coming forward with the ball, but the play was upheld upon review, much to the chagrin of Rex Ryan, who burned a timeout just to yell at referee Mike Carey. Despite the 34-17 final, Ravens fans will undoubtedly find a few things to concern themselves with over the next two weeks before the team plays again. Were the Ravens able to put together any kind of offense through the game’s second and third quarters, the game could have been much more of a blowout than it was. The defense allowed only a single field goal, and even that was on a drive where the Jets started in Ravens territory. The two plays that kept the game interesting – the Harris interception return and the Joe McKnight kickoff return – should have never happened. Of course, if you’re a Jets fan, you’re saying the same thing about three of the four Ravens’ touchdowns. The fact is that, through the season’s first four weeks, the Ravens have blown out two of the AFC’s top teams as well as an NFC bottom feeder, and look every bit as formidable as any squad in the conference. If they can get healthy here during this early bye week – getting Ben Grubbs, Lee Evans, Jimmy Smith, and Chris Carr back on the field would be huge – they can find themselves in a very strong position as the season nears the mid-way point. Even better, the schedule is a bit front-loaded; they still have 3 games against the NFC West teams, as well as two each against Cleveland and Cincinnati. You don’t have to be a complete purple kool-aid drinking optimist to have little problem finding at least 10 wins for this team looking ahead. Again, gotta get – and then stay – healthy. 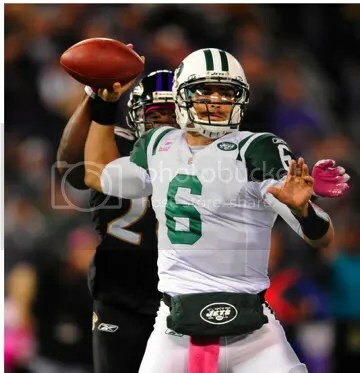 Mark Sanchez would prefer to not have to “deal with” the Ravens any time in the near future. This entry was posted on October 3, 2011 at 11:42 am and is filed under Ravens, Ravens Game Recaps. You can follow any responses to this entry through the RSS 2.0 feed. You can skip to the end and leave a response. Pinging is currently not allowed. You mean Bernard Pollard? Show some respect that man is a God we might need him because I get the feeling we might be bumping into the Patriots sometime in January and he is known for maiming important players on the Patriots. Yeah, Bernard Pollard. That’s the one. Long night. Was still post-tailgating at 1 AM.